Rack of lamb and lamb shoulder steak make for great grilling. It’s hard not to feel tender when cradling a lamb by the ribs — even if that lamb has been dead for longer than it ever lived, slaughtered just weeks after entering the world, living in vacuum-sealed plastic in various states of freeze since death. Even if it’s doomed to be charred in the hellfires of an oven, or, as was the case one recent evening, grilled over hot coals, a lamb's tiny ribcage compels one to cradle it. Young lambs tend to be milder in flavor than older ones, so if you’re tepid about mutton, a quality midsummer lamb is a great place to start. The one we had from Duclos & Thompson was absolutely wonderful — tender and flavorful but not too gamey, and capped with a nice layer of fat. 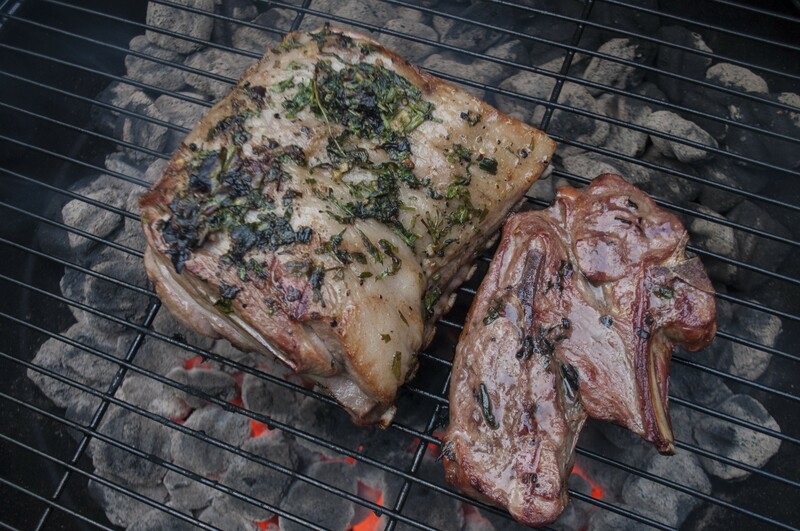 Many people regard the rack as the lamb’s finest cut of meat, but there’s nothing stopping you from grilling it. In fact, rub it with herbs and garlic, salt and pepper, and you’ll be hard-pressed to come up with a finer preparation for summer’s tender chop. This week’s recipe is a play on the classic lamb-and-mint combination and will work with any savory summer herb. Substitute basil or oregano for tarragon, parsley or cilantro for lovage, or mint for any of the above, and you’ll have yourself a ringer, or you can use pesto instead, too. Yes, each herb packs its own unique character, but they all possess a bright, olfactory quality that will play nicely with the lamb. 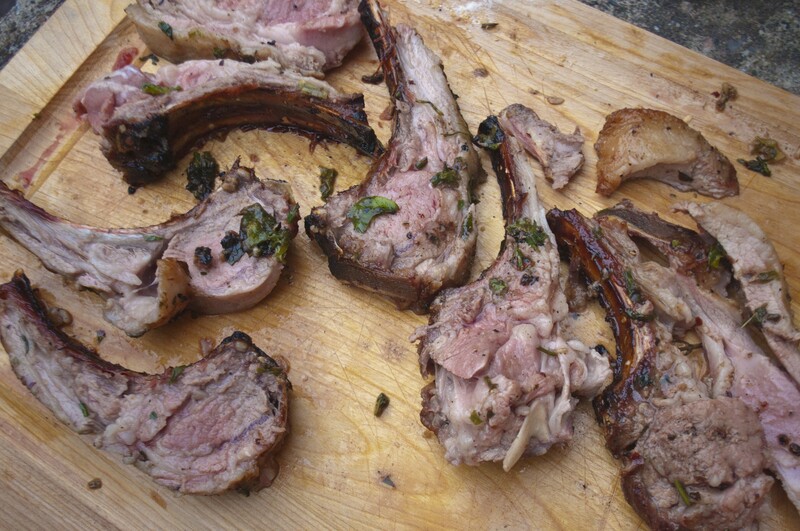 Lamb Lollipops: Even when cut with knives as dull as mine, these make a glorious hand-held feast. Turn on grill or prepare coals and cut garlic and herbs to size. Remove lamb from packaging and pat dry. If the lamb is very fatty, you may want to trim away excess fat before grilling, but if the lamb is rather lean, you’ll want to leave the fat on to prevent the meat from drying out. Most lamb falls somewhere in the middle, and fat-trimming is entirely discretionary. Also, much of the meat’s sheepy character is in the fat, so trimming it will quiet the lamb’s potentially gamey flavor. Combine garlic, oil, herbs, salt and pepper (and chili flakes) in a bowl and mix thoroughly. This should look a little like an oily pico de gallo. Spread herb mixture on the fatty, arched side of the rack. When the grill is hot, grill the rack, flipping every 5-8 minutes, until the center of the rack reaches 135 to 140 degrees Fahrenheit (you'll need a meat thermometer to be sure), and then remove lamb from grill. This will render the beast medium-rare, so if you like your meat cooked through, leave it on a little longer. Depending on the size of your rack, total cooking time can range from 10 to 25 minutes. Let rest 10 minutes, then cut into portions, slicing off one rib at a time, and serve immediately.